‘Seeing George’ is one of the most unusual novels I’ve read recently. It’s a love triangle, spanning fifty years, with a significant difference. But what makes it different? Once upon a time and in the beginning, Violet and Frank were newly married. Violet works in an office. Violet is filing away documents one day when she is interrupted by a new staff member named George. George appears to be an ordinary man to all the other people in the office, but Violet sees him as a dragon. Fifty years later, Violet is dying. Frank is caring for her. During that fifty years, George has been a frequent visitor. And now, as her illness renders her frail and gaunt, Violet resorts to makeup and wigs to try to hide the truth. Frank asks Violet to stop seeing George. Why? There are just three main characters in this novel: Violet, Frank and George. Violet is central, George is magical and Frank is (to me at least) wonderful. Frank is grounded in the painful reality of Violet’s illness and takes care of her. Violet is torn between loyalty to Frank and the magic George brings to her life. It took me a while to accept the magic and the different realities in this story. Relationships are complex. A different kind of romance with some delightful touches. An enjoyable and quick read. 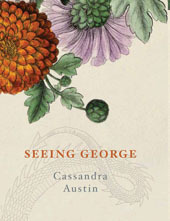 Sign into Goodreads to see if any of your friends have read Seeing George.